Ballachulish is a slightly confusing place. And not just because it has a name that is difficult to spell correctly, or even consistently incorrectly. It's not unusual to find places that come in two halves. But Ballachulish comes in two halves plus another, larger, settlement two miles along the road towards Glencoe. The name comes from the Gaelic for village of the narrows, and the first settlement to bear the name lay where North Ballachulish is today. Its twin, on the south side of the loch, rapidly followed. Loch Leven narrows dramatically here and North and South Ballachulish grew up around the slipways used by ferries crossing the loch from a very early date. A vehicle ferry started to cross the narrows in 1912, but the service finally disappeared in 1975 when the bridge opened. 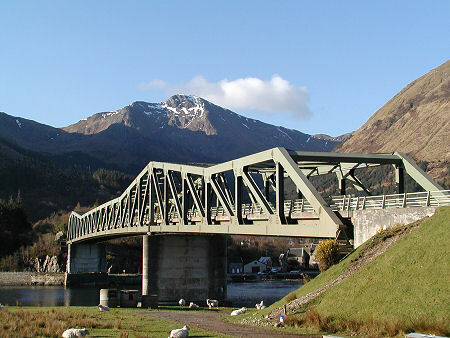 With it disappeared the choice facing drivers of the sometimes long ferry queues at busy periods or the nineteen mile detour via Kinlochleven. While the ferry has long gone, the slipways that served the ferry remain: though they are by no means opposite one another. The steel truss bridge that opened here in 1975 fits nicely into its environment. Indeed, it comes as something of a surprise to find it is such a relatively recent addition to this part of the Western Highlands. 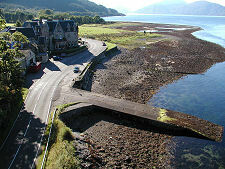 South Ballachulish largely comprises the slipway and the nearby Ballachulish Hotel. Close to the steps leading down from the bridge to the Oban road near the hotel is a memorial to James Stewart, hanged here in 1752 for the Appin Murder. This was the killing of Colin Campbell, an event used as the basis for Robert Louis Stevenson's novel Kidnapped. Stewart's execution was a result of the greatest miscarriage of justice in Scottish legal history. A number of the sites associated with the Appin Murder have been linked by the Last Clansman Trail. North Ballachulish is a little more developed and is home to an art gallery, lochside hotel and the slipway for the old ferry. 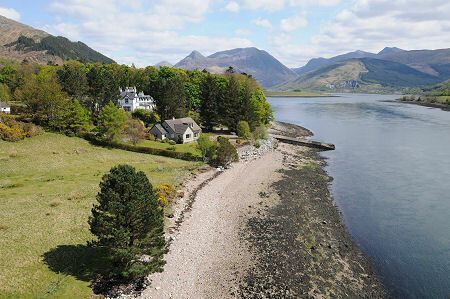 Here, too, you find the excellent Loch Leven Hotel, a real gem and a hotel you would without hesitation recommend to family and friends. At the north end of North Ballachulish, in what at this point becomes Onich, is the attractive St Bride's Church, easy to overlook as the A82 sweeps round a corner. More obvious, on the south shore of Loch Leven east of South Ballachulish, is St John's Church, which unlike St Bride's was not open to visitors when we last passed by. The largest settlement carrying the name of Ballachulish lies on the south side of Loch Leven, a mile or so west of the village of Glencoe. This started life as the hamlets of East and West Laroch in the 1500s, names still attaching to parts of the village on detailed Ordnance Survey maps. In 1693 slate was first quarried here in the Ballachulish Slate Quarries (only a year after the Glencoe massacre took place nearby). By the early 1700s this had developed into a major slate quarrying operation which continued for over 250 years until 1955, when the quarries closed. The name of Ballachulish simply seems to have attached itself to the larger village that grew out of the earlier settlements to house the 300 workers and their families. Ballachulish certainly made a lasting impression on Queen Victoria during a royal visit. Her diary reflects not just the slate quarrying but also the lengths the residents went to in order to decorate the village for her visit. Today's Ballachulish is home to some striking buildings. Perhaps the largest is an attractive modern structure at the southern apex of the triangle which forms the layout of the village. This looks like a secondary school or a hospital, but turns out to be the Abbeyfield Integrated Care Home. At the heart of the village is its shinty club, and opposite the clubhouse is another fine building, which comes complete with a clock tower. This is the Ballachulish wing of the Ministry of Defence's Joint Service Mountain Training Centre. Moving from here through East Laroch towards the eastern apex of Ballachulish takes you past a bank, a shop and a pub, and the Ballachulish Medical Practice. The last of these stands on the site of the railway station that formed the terminus of a branch line railway running from Connel via Ballachulish Ferry. This opened in 1903 and closed in 1966. Further on still, and you pass a hardware shop before arriving at the excellent Ballachulish Visitor Centre, which comes complete with ample parking and public conveniences. Close by are the Ballachulish Village Hall and the Strathassynt Guest House. 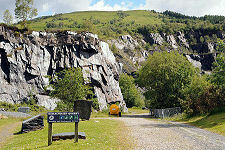 Just across the road from the visitor centre are the old Ballachulish slate quarries, which now provide scenic walks and are well worth a visit. There's no mistaking what they are, but in the half century since they closed, nature has made a start on the task of reclaiming what was once taken from it. 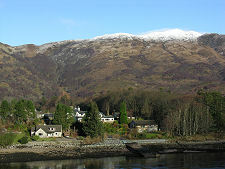 The main settlement of Ballachulish is now largely bypassed by the A82, which passes along the Loch Leven side of the village. There is, nonetheless, direct access to a number of visitor facilities including lochside hotels from the main road.